With ultra-thin profiles to offer maximum knee clearance and designed to withstand the rigors of daily use, our ergonomic keyboard systems make typing comfortable. Longevity is designed into all of our products, and our keyboard systems are no exception, created to be lightweight but incredibly strong. 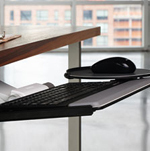 As with all Humanscale products, our keyboard trays adjust to the user and their task, not the other way around. An articulating keyboard system is the most important component of an ergonomic workstation next to the chair. For people who work on a computer for 2 or more hours per day, a high-end articulating keyboard system can provide serious protection from a variety of musculoskeletal disorders, including Carpal Tunnel Syndrome, neck pain, and upper and lower back pain. 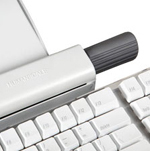 With our advanced technology, award-winning designs and hundreds of options, Humanscale has been the market leader in articulating keyboard systems for 5 years running. We pioneered intuitive adjustability and eliminated knee obstruction. And our newest offerings remain several steps ahead of the pack. If you're serious about working in comfort, you've come to the right place. We offer a full line of premium mechanisms, keyboard platforms, mouse platforms and palm rests to meet the needs of a wide variety of individuals, workstations and office environments. By combining these elements, you will create the most non-intrusive, intuitively adjustable keyboard support available. If your needs are not met by any of our standard options, we can create a solution customized to your specific requirements. Each of our platform options is designed to ensure that users type and mouse within their Neutral Reach Zone, thereby encouraging safe, sustainable working postures.